Carmel Mountain Ranch View homes for sale in Carmel Mountain Ranch are among the most sought-after in Southern California! Located just 10 miles from the Pacific Ocean and 25 miles from Downtown San Diego is one of the most uniquely beautiful and finest family communities, Carmel Mountain Ranch. This newer and attractively priced, master planned community has an estimated population of 13,000 and is filled with middle to upper class real estate neighborhoods. View homes for sale in Carmel Mountain Ranch, which are among the most sought-after in Southern California, offering panoramas of soaring mountain peaks, which are complemented by lush landscaping and abundant sunshine. View more about Carmel Mountain Ranch on Pinterest! 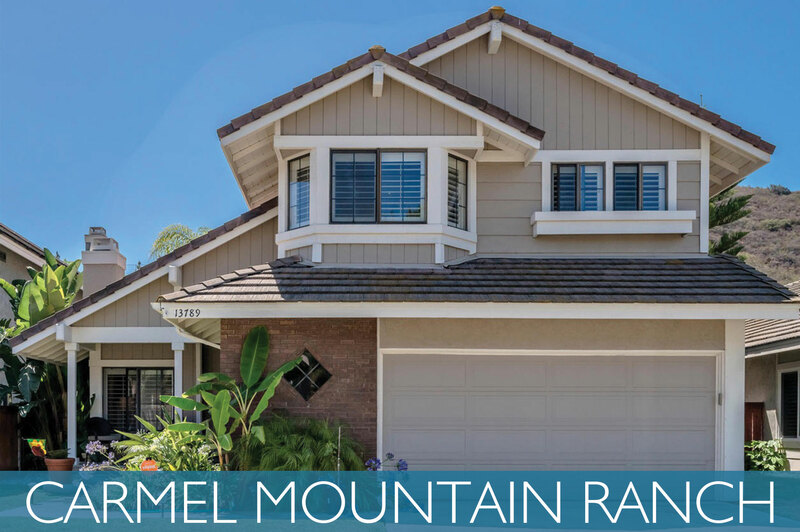 Carmel Mountain Ranch offers a wide selection of home styles and exceptional prices from stylish condos offering immaculate quality, and utterly amazing swimming pools and fitness centers to peaceful and secluded four bedroom villas in exclusive gated communities with stunning views. But of all the beautiful Carmel Mountain Ranch properties, none stand out as much as the luxurious golf properties surrounding the prestigious Carmel Ranch Country Club. This championship golf course is one of the foremost in Southern California and offers 6,400 yards of fabulous fairways, panoramic views, and unbelievably fast greens. Not only is the course itself impressive, but there are also several other great golf courses to enjoy in the surrounding area. From first time home buyers and couples just starting out to families and new retirees, Carmel Mountain Ranch has something for everyone. There are an unlimited amount of recreational opportunities including a world class golf course, safe and well-maintained community parks, baseball facilities, jogging trails, picnic areas, and playgrounds. Other amenities include numerous shopping plazas and restaurants and easy freeway access, making commuting in and out of the greater San Diego metro area convenient and easy. Carmel Mountain Ranch is also part of the outstanding Poway Unified School District. Recognized as one of the most notable school districts in California, Poway Unified School District is also one of the highest-scoring districts in San Diego County.